﻿ Lane Hooven House - Ohio. Find It Here. 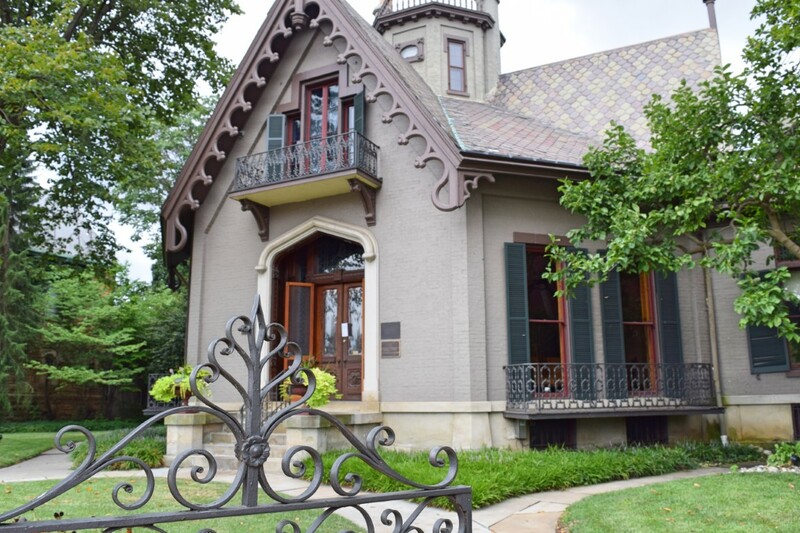 This rare, restored octagonal home with a unique spiral staircase was built in 1863 and was the home of Clark Lane, a prominent Butler County industrialist and philanthropist. The Victorian Gothic house is highlighted with ornate details on the exterior and fancy multi-colored wallpaper and wall stenciling on the interior. Because of its octagonal shape this house is widely regarded as Hamilton's most unique residential structure, and is sometimes called Lane's Folly. Construction began in 1863 and took 11 months from commencement to completion. The doors were always open for every charity and aid society. The largest entertainment numbered more than 300. In 1866, Mr. Lane built another octagonal building across the street from his home, this one in the Romanesque Revival style. It was to be used as a free public library.